London-based mobile accessory company, Echo, offers its customers a nice range of mobile charging options, including portable batteries, cables and more. I recently had the opportunity to put a couple of their products through their paces and wanted to share my impressions. 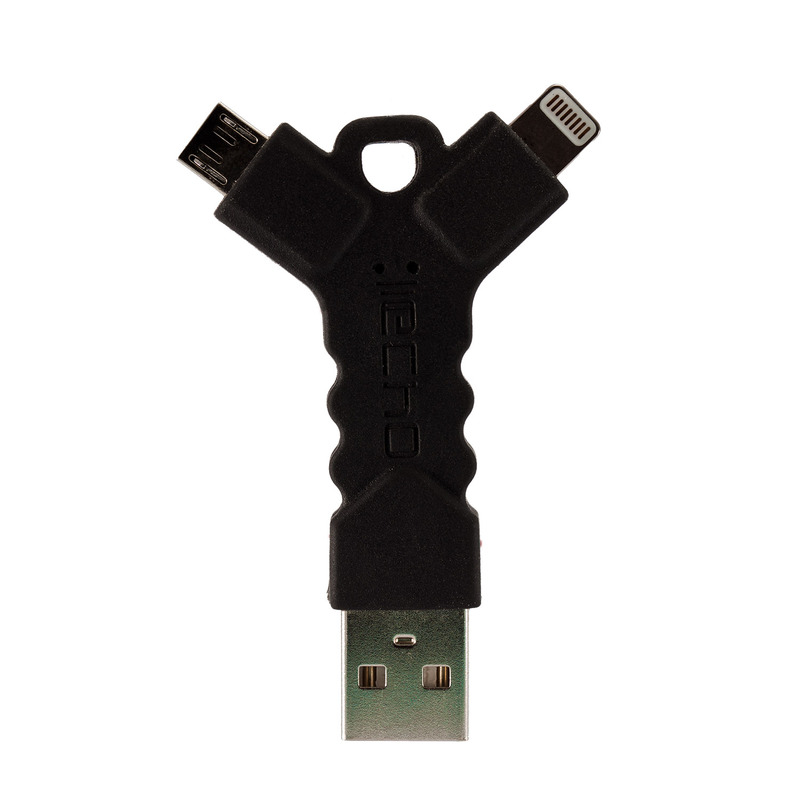 First up is Echo’s Connect key, a super handy little 2.5″ tall Y-shaped dual connector device that fits perfectly on your key chain and gives you anytime access to both lightning and micro USB charging. Not much bigger than your standard house or car key, the connect key’s convenient, compact size means you’ll never have to worry about finding a charging cable, because you always have one on you, just find yourself a standard USB port and plug in. A big plus is that the lightning connector is MFi certified so you don’t have to worry about a future iOS update killing its compatibility and the connect key can be used for syncing data with iTunes as well. I’ve been carrying mine around on my key chain for several weeks now and everything still looks and works great, the connectors are sturdy and attached well and the rubber portions of the device have some nice flex to them. I’ve used the Connect Key to charge my phone from my MacBook, PC and in my car and it works great. There may be times when you’ll want to use your connect key with an iPad and an alternative USB power source (other than a PC as they generally do not output enough power to charge an iPad). One small issue I ran into is that depending on the location/orientation of the power source’s USB port, it could possibly be difficult to find an ideal position to charge an iPad due to the shortness connect key and the angled connector and the bulkiness of the iPad. It can be done, but you may find yourself having to get creative. All in all, I have found the Connect Key to be an invaluable product to have on hand and it’s replaced my (lightning-only) Nomad. Even with Apple’s new low battery mode on iOS 9, you never know when you might need to top off your phone and this can be a life saver. The Echo Connect Key can be purchased for somewhere in the range of $20. Sometimes you may need a charge, but there is no USB power source around to plug into or you forgot your charging cable. 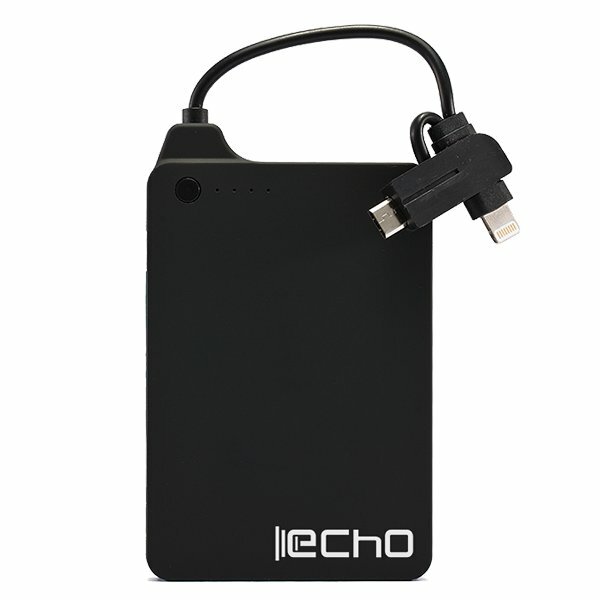 Well, Echo has you covered there as well with their PowerConnect / PowerConnect Mini line of very portable batteries. Measuring in at just about 2.25″ wide x 4.5″ tall X 0.5″ thick and weighing 3.26 oz., this portable little battery not only packs a charge of 4000 mAh but also includes an attached combination micro USB / MFi-certified lightning connector so you don’t have to worry about carrying around your own charging cable too. Included in the box is a super tiny USB to micro USB cable for recharging the battery pack itself. Also available at the incredibly tiny dimensions of just 1.6″ wide X 3.6″ tall X 0.875″ thick and just 1.5 oz is the adorable PowerConnect Mini which comes in separate 1600 mAh lightning and micro USB models. iPhone 6 and 6S battery capacities are 1810 mAh and 1715 mAh respectively, so the PowerConnect will easily supply multiple full iPhone re-charges (or 1+ full iPad re-charges) on a single charge of the PowerConnect itself. You won’t quite get a full charge on the 1600 mAh PowerConnect Mini, though it comes pretty darn close. The iPhone 6 Plus however, is another story with its 2915 mAh battery, unfortunately you’ll only be getting about a half of a charge out of the PowerConnect Mini, but it is still great in a pinch. The PowerConnect will set you back about $38 and the PowerConnect Mini $23. While these are a bit more expensive than a number of the generic, plain vanilla battery options, the diminutive size and attached cable are super convenient features which help justify the added expense. The fact that Echo is a UK-based company probably also doesn’t really help the price for US buyers either. Finally, one product that I have not yet tried, but which looks super impressive is Echo’s upcoming $10 five-foot braided nylon, MFi-certified charge and sync lightning cable which comes with a lifetime warranty. Currently over-funded on Indiegogo, with just a few days to go in the campaign and a delivery date by Christmas, the IronWire looks like one RATHER IMPRESSIVE lightning cable. It even features a small LED light which flashes when your device is fully charged! To show just how strong and resilient the cable is, in one of the campaign videos, Echo shows it being used to pull a car as well as hang a woman from a swing. Once again, due to Echo being based in the UK, the shipping costs for US buyers is a little pricey. Two IronWire cables backed with a pledge of $20 will end up costing you an additional $15 for shipping, or $17.50 per cable. The more cables you buy the better the average, per-cable shipping cost. For more details about these back the IronWire cables, you can visit the back the IronWire cablesIndiegogo project page. Should you decide to back the IronWire cables it is worth noting that there are certain perk levels where you can can also add on a Connect Key and/or other Echo accessories, saving you a little money on the shipping as well. Echo has some great accessory offerings whose quality warrant a fair price. If you are in the market for mobile power accessories that are not just your run of the mill generics, then these are definitely worthy of your consideration. I hope that this latest successful Indigogo campaign will help Echo get more of a presence here in the US as they are a more than worthy contender for retail shelf space here in the States.